We’ve come full circle on nuclear disarmament. In the late 1950s, the Aldermaston Easter marches  (from the British Atomic Weapons Establishment near Aldermaston to Trafalgar Square in London) urged British governments to ‘Ban the Bomb’. 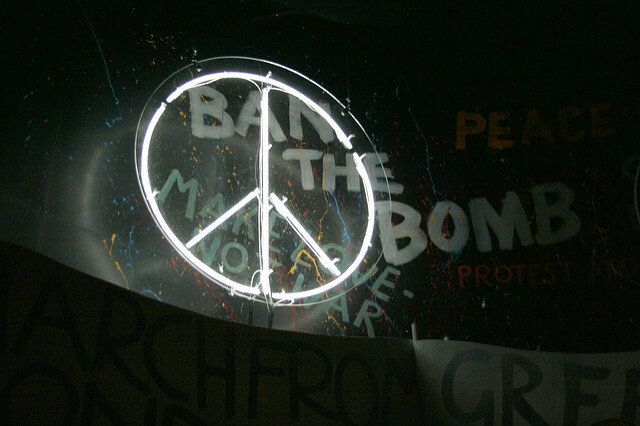 Around the Western world, protesters’ numbers swelled in parallel with global nuclear arsenals, so that by the 1980s they represented a substantial social movement. Music slid towards nuclear fatalism . The BBC mini-series, Edge of Darkness , depicted a struggle for the planet between pro- and anti-nuclear forces. Governments, meanwhile, focused upon specific arms-control measures. A plethora of agreements sought to minimise the pressures for nuclear proliferation (the NPT), constrain nuclear testing (the PTBT, the TTBT, and the CTBT), restrict ballistic missile defences (the ABM Treaty), cap and reduce offensive nuclear arsenals (SALT 1 and 2, START, New START, and the INF Treaty) and establish a variety of Nuclear-Free Zones. As those agreements unfolded—and in particular as the Cold War ended—protesters fell away. But today the ban-the-bomb aficionados are back, and they feel cheated. They’ve come to believe that arms controllers value nuclear stability more than disarmament. They worry that the NPT contains no timetable for actual disarmament. And they fear that current nuclear modernisation programs will keep nuclear weapons at the core of many states’ strategic postures for most of the 21st century. So over recent years we’ve witnessed a perverse hijacking of the nuclear arms control agenda. Quite suddenly, disarmers have been seized once again with the notion of ‘banning the bomb’, and UN working groups and committees—not the grimy road to Aldermaston—have been their fora. The narrative of arms control and disarmament has been inverted, so that countries like Australia and Japan, which focus on overcoming the hurdles that stand in the way of that enterprise, are labelled ‘spoilers ’ and ‘refuseniks ’. Meanwhile, those advocating a ban insist that delegitimising nuclear weapons would be a major step forward —even though doing so would remove not a single warhead from the world. Perhaps this new enthusiasm for retreating to the 1950s has something to do with the fact that President Obama’s term is winding rapidly to a close with all the great hopes of his 2009 speech in Prague  still unfulfilled. Perhaps it has something to do with the fact that the architecture of nuclear arms control looks tatty and frayed in a world of escalating geopolitical tensions. Whatever the drivers, the current ‘ban’ movement threatens a serious reorientation of global efforts to rein in nuclear weapons. It harks back to that earlier era of sullen placard-carriers, who believed that wanting to put an end to nuclear weapons was all that was required to achieve the objective. Australia has long been a champion of nuclear arms control and (eventual) disarmament. And, yes, like about 40 other countries, it’s also been a beneficiary of US extended nuclear assurances. But it’s never believed that merely wanting nuclear disarmament would be enough to achieve it. It’s true that arms controllers typically prize stability above disarmament—but that’s because one logically precedes the other. If we don’t manage nuclear problems over the short-to-medium term, there’s a good chance we’ll never have to worry about negotiating the final steps to nuclear zero. And make no mistake, those steps would be hard work. As I’ve written before , there are three problems: getting to zero, staying at zero during future crises and designing a stable strategic order without relying on ultimate threats. Getting to zero’s difficult not just because nuclear weapons speak a unique dialect of the language of deterrence, but because we honestly don’t know how many nuclear warheads exist now. Staying at zero’s problematic because countries facing defeat in future wars will always know there’s an equaliser close to hand. A nuclear-free world would be haunted by the prospect of breakout—and we have no guarantee that patterns of reconstruction would merely return us to the (mostly) stable balances we have today. As for designing a future strategic order without nuclear weapons, well, good luck with that. One lesson we should have learned from the pre-nuclear world is that conventional-force deterrence fails regularly. Those are the challenges that serious disarmers have to confront, and I hope Australia will continue to champion an agenda that addresses them. A treaty that delegitimises nuclear weapons—if it does come to pass—isn’t a helpful way forward. The world doesn’t need another international treaty from which the key players are absent. And it looks like all of the key players—all the nuclear weapon states and all countries benefitting directly from extended nuclear assurances—would be absent from this one. Rod Lyon is a senior fellow at ASPI. Image courtesy of Flickr user Lamerie.